We were really pleased with the way our van was adapted and stamped with our company brand. 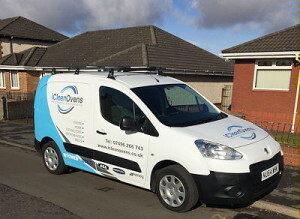 Stephen at Auto-Art in Shotts, Lanarkshire, did a terrific job of designing and applying the van livery with our logo, blue and silver curves. We love the blue, white and silver colour scheme and the crisp clean cooker brand logos. 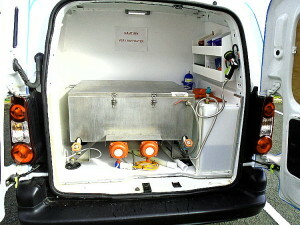 The inside rear was adapted to take the special cleaning tanks and dipping system for cleaning oven racks, grill pans, rails and other removable oven parts. These all soak in the special eco-friendly fluid while we clean the interior of the oven and anything else that is on the cleaning order, like hobs, extractor hoods, grills and microwave ovens. 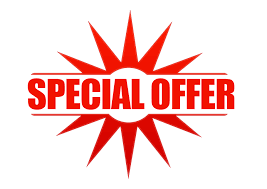 If you and a neighbour both arrange an appointment for the same day, one after the other, we will give a £5 discount to each of you.